Crochet curtains are a great way to decorate your home with handmade flair. Perhaps you don't want to make crochet curtains, either because you're looking for a smaller project or because you love the curtains that you already have in your home. Crochet curtain tie-backs are a simpler, quicker, more affordable crochet project that can give that personal touch to the style of your space without taking up a lot of your time. Here are 19 free crochet curtain tie-back patterns. Some of these are specifically written as crochet tieback patterns and others are designed as garlands or bunting but would work perfectly when wrapped around the curtains in your home. This is a thread crochet pattern worked in the niche of filet crochet. Filet crochet is easy to learn since it is based entirely on chains and double crochet stitches. If you haven't already learned this niche, here is a great pattern to work on as a beginner. This free crochet pattern teaches you the crochet iCord, which is a technique you can use for a variety of different applications. It is a great thing to know and it's also a pattern that works great as a simple curtain tie-back. You could make these in a variety of colors to swap out for decorating during different holidays. This free crochet pattern by KarenGlasgowFollettDesigns works up quickly with worsted weight yarn and a size J crochet hook. This is a really straightforward simple crochet pattern by Horizontal Designs. It uses basic crochet stitches worked across just two rows for an easy and quick design. There are instructions for making a wider version of the same tieback. This is worked in worsted weight yarn and you could adjust your color choice to match your own decor. One of the things nice about crochet curtain tie-backs is that you can easily change them out from season to season to adjust your decor without a lot of effort. This floral crochet pattern is a great choice for bringing springtime into your rooms! It is a great crochet pattern for curtains in any room, especially the kitchen! This free pattern is by Sandra of Cherry Heart. It is written in UK terms with info for converting to US terms. She also has a free pattern for rose crochet curtain ties. Here is another floral crochet curtain tie-back pattern, this one by Irene Strange via the Top Crochet Patterns website. This one has a cute element - the ties themselves are designed as vines or stems with leaves to accent the flowers themselves. This is another great springtime crochet pattern although changing up the colors would make these usable throughout the year. This is a motif-based crochet pattern that combines flowers and leaves into one thick piece. It can be used as a curtain tie-back but it can also double as a crochet statement necklace! This is a free pattern over at Crochetology. It is made with crochet thread or lightweight yarn. Ms. Premise-Conclusion used a free DIY crochet tutorial from CraftStylish to create these retro "kitschy" crochet curtain tie-backs. The tutorial explains how to make the basic backing for the tie and then suggests some patterns for adding on the flowers, although you could use any crochet flower pattern that appeals to you. This free crochet pattern shows how any decorative edging design could be used as a beautiful curtain tieback. The design here is a simple butterfly that repeats across an attached border. It is a great piece that could be replicated using other motifs as well. Do you want your curtains to show off your love of yarn? This free crochet pattern by Posh Pooch Designs does exactly that by adding a yarn ball element to a crocheted tie back. This is a perfect design for the curtains in your craft room or studio space. Crochet Granny has suggested using crochet garlands as curtain tie-backs. This opens up a whole new world of possibilities for designs when looking for patterns! This free bunting crochet pattern by Jessie At Home could be wrapped around a curtain for a bold tie-back. This would be a long curtain tie that wraps around quite a bit of the curtain, perfect for long curtains like those over a sliding glass door or a floor-to-ceiling window. This very first crochet pattern by designer Puella Docta is a terrific fall bunting pattern that could also be used as a tie-back for curtains during October and November celebrations. You could make it as designed and wrap it around the curtains multiple times or you could make it shorter and shrink the spaces between the pumpkins for a better size fit to your curtains. This cute free pattern from My Creative Blog shows you how to create two different styles of crochet lemons (full size and slices) and then to string those into bunting. The same idea could be used to make a crochet curtain tie-back, with either or both lemons worked into the design. This would make a great design for summer curtain ties and would work especially well in many kitchens. The basic design also gives you an idea of how to make bunting or tiebacks using any motif and hanging from a basic crochet chain. This is another great option for summer decoration. It is a watermelon crochet pattern designed by The Little Bee. It is intended as bunting and would certainly work great for that purpose but it could also be wrapped around a curtain to add a bright pop of pink color to the rooms in your house. You could also use the basic design without the seeds, worked in a different color, to create triangle curtain tie-backs in the shades that you want for your home. You can make a real statement in your home by adding amigurumi curtain tie-backs to your windows. Zan Crochet has a couple of different patterns including this free frog pattern for holding curtains out of the way in style. This would be ideal for a children's room. Here is another adorable amigurumi wrap-around design that works perfectly as a children's curtain tie-back. Stitch11 designed this free teddy bear crochet pattern for Stitch and Unwind. It is made with worsted weight yarn and a size H crochet hook using basic stitches. 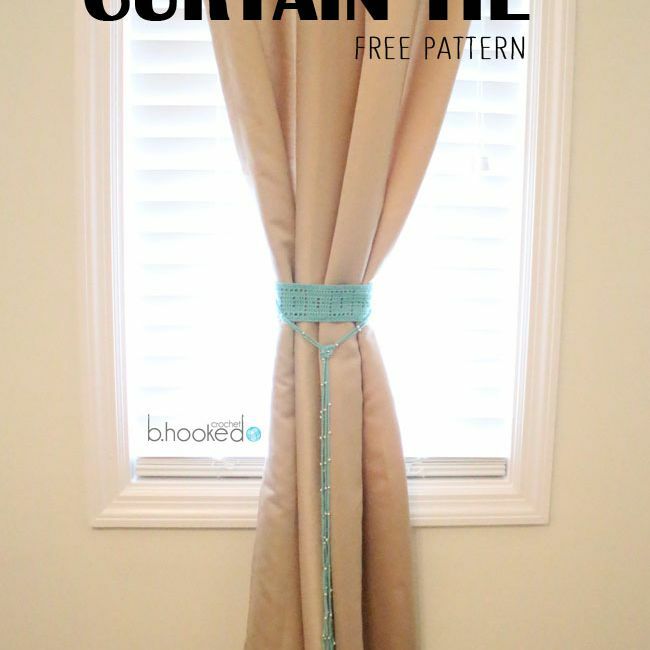 What a fun addition to any curtains you already have in your home! Crochet curtain tie-backs were particularly popular in the 1930s and there are many vintage crochet patterns from that era for this type of home decor. This is just one example of a thread crochet pattern by Cotton Spool Co. for tiebacks. Crochet curtain tie-backs continued to be popular into the 1940s, as evidenced by this Bucilla thread crochet pattern offered free from AntiqueCrochetPatterns. This is a really simple pattern that could quickly add refreshing new style to any home.